University of Georgia ecologist Andy Davis and his students studied beetles and their parasite loads last summer as part of the Research Experience for Undergraduates program at UGA, sponsored by the National Science Foundation. Their results—that infected beetles were slightly more likely to lose fights—were published earlier this month in the journal PLOS One. "This project was very fun to work on and yielded some interesting findings that will add to a larger body of work on animal behavior and how parasites influence behavior," said Davis, an assistant research scientist in the UGA Odum School of Ecology. The Population Biology of Infectious Diseases REU Site, a nine-week NSF-funded program at UGA, is designed to train undergraduates in quantitative and experimental methods in infectious disease biology. Now in its third year, the program attracts students from all over the U.S. who spend the summer at UGA working on research projects with scientists from a variety of disciplines and departments. "There is a real need to boost the national talent base in quantitative biology," said program director John Drake, a professor in the Odum School. "Bringing together data science and dynamical modeling is particularly key. This program aims to endow students with specialized skills early in their scientific training with the hope that these skills will be leveraged as students move into graduate programs and the research workforce." Paper lead author David Vasquez, a student from Virginia Polytechnic Institute and State University, worked with Davis on the study of horned passalus beetles. Also known as bess beetles, they are a common species native to the U.S. that are often found to be infected with a small nematode parasite that lives in their bellies. Individual beetles can harbor thousands of these tiny worms, but it was not known what-if any-effect these parasites have on beetle behaviors such as fighting. 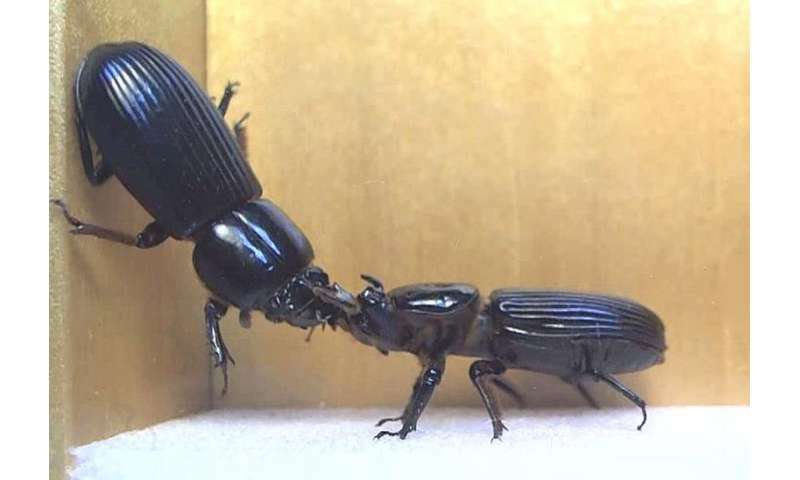 Like many animals, beetles occasionally fight with one another over nest sites, and these fights often involve one beetle trying to flip the other over. To see whether parasites made a difference in these fights, Vasquez, Davis and study co-author Anna Willoughby, an undergraduate from Duke University, pitted randomly chosen beetles against one another in a series of battles that they timed and observed. After determining each beetle's win, loss and draw statistics, they checked its parasite load. Compiling data from hundreds of bouts, they found that beetles with parasites lose more matches than those without, although the difference was small. They also found that parasite-laden beetles tended to make fewer aggressive moves. And surprisingly, they found that of the beetles with parasites, those with higher parasite burdens won more fights that those with fewer parasites. "So it turns out parasites do matter, at least a little," Davis said. "But there's still a lot to learn about this host-parasite system."